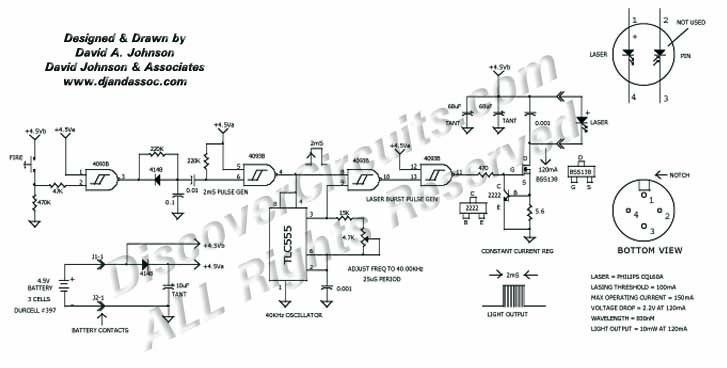 Circuit: MICRO POWER 40KHz BURST LASER DIODE DRIVER__ Circuits designed by David A. Johnson, P.E. Some laser tag or simulated combat games can use this circuit to send short bursts of modulated laser light at the opponent's vest, equipped with a matching light receiver. The circuit operates from three 1.5v cells (4.5v) that should provide enough energy for about 200,000 shots.